There is a band out there, named after a guitarist you’ve probably heard of, that’s truly one of the greatest rock bands of all time. When you hear the name, you may scoff at that idea – but 90 million records sold worldwide and eight Grammy Awards may convince you otherwise. Not bad for a guy that was once told not to quit his day job. The Carlos Santana Blues band was formed in 1967 in San Francisco, California. Originating as a seven person band, having such a large group was unusual for the time. The band’s first audition was at the Avalon Ballroom in the late summer of 1967. After their set, the promoter of the upcoming concert told the band they would never make it in the San Francisco music scene playing Latin fusion music. The gentleman, named Chet Helms, was one of the more well-respected promoters of the era. He suggested Carlos continue washing dishes at a local drive-in and leave music to the professionals. Thankfully, Mr. Santana didn’t listen and continued to play and look for management. He found it in a fella named Bill Graham. Graham was a big fan of the band and he was asked to help plan the logistics for a major upcoming event called Woodstock in 1969. He only agreed to help out if this unknown band now just called ‘Santana’ could play. 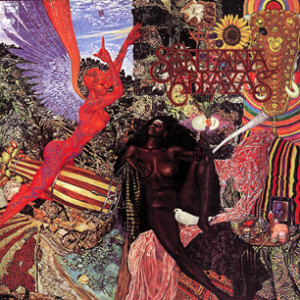 Santana was added to the bill, played in front of a huge crowd, and one month later they released their debut album. It would go on to peak at number four on the Billboard top 200 chart. Today I’m listening to Santana’s sophomore effort, Abraxas which was released in September of 1970. Since Woodstock and their debut album had just been the year prior, many critics at the time felt the quick second issue was just a way to capitalize on their initial heat. Those critics were quickly converted to full-on Santana fans after just one listen. The mix of rock, blues, jazz, salsa and various other worldly influences was well-received from the day it came out. You can listen to their debut and Abraxas back-to-back, and really see how the band refined their sound and matured greatly over the course of that year. There isn’t a whole lot not to like about this record. I know some people are cagey about instrumental tracks—and this album has a couple—but they really flow well with the album as a whole. Since I don’t mind those types of jam tracks, the only flaw I can see in it is that it’s only 37 minutes long. It could go on another half hour and I’d be thrilled. Santana’s guitar work is mesmerizing, and the combination of styles is so unique not only for the time, but even for today. You simply just don’t hear rock and Latin music combined so beautifully. In the 2003 Rolling Stone magazine’s Greatest Albums of all Time, this sits at #207. I might put it a touch higher, but it’s a great recognition. An unquestionable piece of music history, and given it’s almost a half a century old and still rocks pretty hard, it’s clearly a timeless record. Definitely worth your hard-earned $5 dollars today.